Today marks the 68th birthday of arguably the most popular actor in Bollywood history. Born the eldest of two children and initially was given the name Inquilaab (inspired from the famous phrase Inquilab Zindabad during the Indian independence struggle) but eventually named Amitabh which means, "the light that would never go off." The name certainly rang true as he ruled the silver screen during the 1970's and most of the 1980's. After taking on a series of questionable roles during the 1990's he rebounded for the second act of his fabled career by hosting the Indian version of 'Who Wants to be a Millionaire' and with the hit 'Mohabattein' alongside Shah Rukh Khan. His star continues to shine brightly with brilliant turns in unique movies such as 'Paa', 'Black', 'Cheeni Kum' and 'Sarkar'. Not bad for someone who applied for his first job as an announcer for All India Radio - and was summarily told he "did not have a suitable voice" for such a vocation. 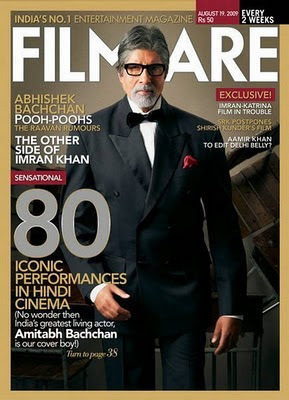 Growing up in the 1970's in America, Amitabh Bachchan was the first Indian actor I was exposed to and he quickly became my favorite actor as well. Thus the films from his heyday remain my favorites but I still enjoy his later work immensely. 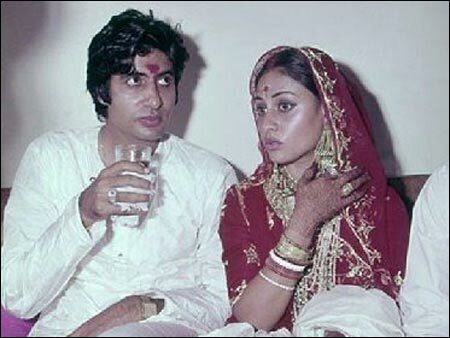 However when it comes time to re-watch a film by the Big B nothing scratches that itch than the great masala films he made in the 1970's. And to this day, 'Sholay' remains my favorite movie of all time while 'Abhimaan' (which stars his wife to be Jaya Badhuri) remains my favorite soundtrack and is in my top 10 of movies as well. The scene above is one of the most famous of his career and is reenacted in all of his concert performances. It is from the classic movie 'Deewaar' (1975) and starts at the 5:00 mark with English subtitles. Major spoiler if you haven't seen the movie (a must see for any true fan of Bollywood and here is write up on it by yours truly) and showcases why, imho, he remains unmatched as an actor to this day.